"A Light upon the lee!" Its the light on old Cape May. Although the English are believed to have laid the ground work for a lighthouse on the cape as early as 1744, there has yet to be found positive proof that the lighthouse was actually built. What is certain is that Congress granted authority for the appointment of commissioners to purchase a site on Cape May for the erection of a lighthouse. The site selected was a high bluff at Cape Island (Cape May City) in front of the property later occupied by Congress Hall. A deed dated September 23, 1785 conveyed title of a tract of land from Thomas Hand II to the Board of Wardens of the Port of Philadelphia.A letter dated November 12, 1785 confirms the conveyance. There is no evidence as yet, however, that the lighthouse was actually completed. A search of old maps of the area reveals that the earliest map of the region, a 1779 Des Barres chart does not show a lighthouse at Cape May, but does indicate a lighthouse at Cape James (now called Cape Henlopen). The earliest map on which the Cape May lighthouse is shown is the map from the 1828 edition of Gordon's Gazetteer. ...70 feet high, arched at the top, with a revolving light consisting of 15 lamps. One hundred steps led from the base of the tower to the walk at the top which was surrounded by an iron railing...It was 65 feet high to the base of the lantern. The wall was 25 feet in diameter and 6 feet thick at the base, tapering to 2 1/2 feet thick at the top. The light flashed to distinguish it from its counterpart across the bay at Cape Henlopen, Delaware, whose light was fixed. 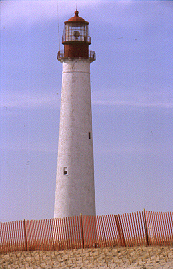 Cape-May light-house.-Revolving; burns fifteen lamps; the foundation appears to be settling; stucco on the tower bad. As is frequently the case with such structures, the elements in general, and erosion in particular, are a constant enemy. The sea had eroded the beach so that by 1847, the tower was surrounded by water at high tide, and it continued existence was threatened. the lighthouse was discontinued as untenable on May 1, 1847. A second lighthouse was built about a third of a mile inland from the old light, on a high bluff called Great Island. The firm of Samuel and Nathan Middleton were selected as the contractors. The new lighthouse was built 75 feet high to the base of the light, and 94 feet high to the dome, showing a light 14 feet higher than its predecessor. The light was produced by 15 concave reflectors mounted on a triangle making a full light every minute. Tower built in 1847, by Samuel Middleton and Nathan Middleton, contractors; tower 78 feet high; keeper took charge April, 1850; removed predecessor; no training or experience before taking charge; no instructions as to the mode of doing the duty; thin-plate glass 20x28 in the lantern; no paint in dome or frame of lantern-painted black originally; astragals and sashes rusty, and greatly in want of paint; iron conductor; rough square box for leading weight of clock-work movement down; wood-work rough beyond anything seen before; everything rough and unfinished; tower damp, from base to lantern; a rough hole through the arch of lantern floor for leading weight to clock-work; the whole thing crude in the extreme; cement in this hole good and perfectly hard; tower wants whitewashing outside and in; stairs leading to lantern clean; trims lamps once every night; leaves the light at 9 o'clock and returns at midnight; lights up after sunset, when he thinks it right to do so; extinguishes lights a little before sunrise. Has a copy of written instructions from collector, (appointment.) Has no printed instructions; never received any. Keeps a tally of oil consumed by the light-house and dwelling combined; oil always good; received oil from Captain Howland, June 21; summer oil 354 gallons, winter oil 152 gallons; no rule as to the quality or quantity left; no supplies bad; no trimming-scissors; no repairs since keeper came here; Captain Howland overhauled lamps, repaired burners and put in new burners; two spare lamps and burners; does not know when light was inspected, but not since about June 1850; reported condition of the walls-need whitewashing; has never been supplied with paint or whitewash; no putty; no repairs on buildings except oil-house; no brooms or brushes for cleaning; good water, well out of order; got discouraged at not getting what he asked for, and did not apply any more; cannot tell when the tower was whitewashed inside-outside last spring; burners bad, 7/8 inch; no storerooms or shelves for wicks, chimneys, tripoli, c., summer oil very offensive to the smell; winter oil not so bad, very light color; Howland left two tanks, of bad tin, (thin.) No journal kept; makes returns once a quarter in the usual form; collector at Wilmington, Del., is the superintendent. Dwelling built in September 1847; leaks through the walls in a stream; rain drives in at the windows; plastering broken; whitewashed three weeks since; windows loose; oil consumed last year for house and lamps, 449 gallons; (evidently a bad light, and a great want of ventilation;) Howland wanted to know what had been done the over over and above the quantities used by the keeper; Captain H. sounds the oil-tanks, determines what is on hand, and leaves what quantity he pleases; keeper receipts for the quantity he says he leaves; has no means of ascertaining the quantity; does not know how much the tanks hold; Captain Howland remains less than half a day, usually; no clock allowed; finds his own timepiece. Despite its relocation, the second Cape May Lighthouse met the same fate as the first. In 1859, the second lighthouse was razed and the present lighthouse was constructed, a thousand feet further inshore. Up until a few years ago, some of the foundation of the 1847 tower could be seen on the beach in front of the present lighthouse. The foundation of the 1847 tower remained for many years after the tower was razed and was used as an ice-house in the 1860's, and as a stable at the turn of the century. 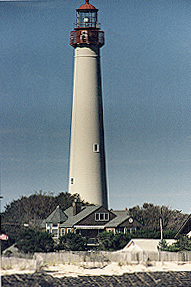 The third and present Cape May Lighthouse is 157.5 feet tall (170 feet to focal plane), has a base diameter of 27 feet. The tower has both and inner and outer wall with a space in between. The outer wall is 3' 10" at the base of the tower. The inner wall is 8.5" at the base. The diameter at the top is 13'6" (15" to base of watch gallery). At the time of its construction the lantern was equipped with a first-order Fresnel Lens, and kerosene wick lamps. In 1910, the lamps were replaced with incandescent oil vapor apparatus. This too, was replaced in 1938 with a 250 watt electric bulb which cast a beam 19 miles. The following recommendation made in the Board's last four annual reports is renewed: This is a first-order seacoast light, and three keepers are employed to attend it. There are quarters for only two families, and the third keeper has to be accommodated by make-shift arrangements which are thoroughly unsatisfactory and detrimental to the discipline and efficiency of the service. It is estimated that an additional keeper's dwelling can be built here at a cost not exceeding $4,000, and it is recommended that an appropriation of that amount be made therefor. The wheels of government turn slowly at times, for work on the additional dwelling was not even begun until 1902. The 1903 Annual Report of the Lighthouse Board noted that work was still progressing on the house. In 1932, the Superintendent of Lighthouses for the Philadelphia District, Irving L. Gill, circulated a letter among the maritime community asking for opinions as to whether the lighthouse ought to be abolished in the interest of economy. Fisherman and skippers began an organized protest against the light's extinction. It was decided to keep the lighthouse in operation. Despite the results of the survey, times were changing, and in 1940 there were rumors that the Coast Guard, (successor of the Lighthouse Service) was going to discontinue the lighthouse. The Coast Guard was quick to deny this, but cautioned that such a decision be made after all factors made been considered. The Mid-Atlantic Center for the Arts is currently leasing the lighthouse from the state, and has restored and repainted the lighthouse to its former glory. In 1934, the Lighthouse Service notified mariners that the characteristic of the Cape May Lighthouse would be changed temporarily. On September 27th of that year, the light was changed to a sodium vapor light, which gave the beacon a yellowish cast. The flash was changed also to show for six seconds every thirty seconds, followed by an eclipse of 24 seconds. The Fresnel lens was removed in 1945 by the Federal Government and placed on permanent loan at the Cape May County Historical and Genealogical Museum in Cape May Court House. 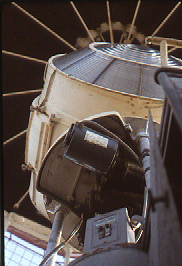 The lens was replaced by a 36-inch rotating aero-beacon lens, equipped with a 1,000 watt bulb. This arrangement produced 350,000 candle-power. The lens was elevated 1.25 degrees to help air traffic also. The lighthouse lens flashes once every fifteen seconds.